Combine visits to the Mystical Pinnacle Desert, the Lancelin San Dunes (including sandboarding), and the Sorrento Quay Hillarys Boat Harbour on a 10-hour trip from Perth. Lunch and round-trip transportation from Perth hotels included. Begin your day's adventure with convenient pickup at your Perth hotel around 8am. In a comfortable tour vehicle, set out for the Sorrento Quay Hillarys Boat Harbour. Once there, spend some free time exploring the Marina. Snap photos of the boats docked, shop for souvenirs, or sit down for some tea at a local eatery (own expense). 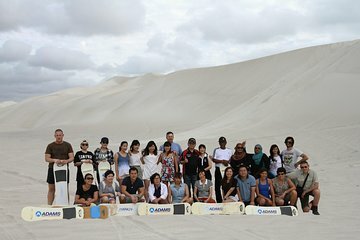 Move on to the Lancelin Sand Dunes, where you'll try out sandboarding down the immense and shifting hills of sand. Refuel with an included lunch at the Lancelin Beach Hotel, followed by an optional walk down to the beach and a swim to cool off. The day's last activity is a leisurely trek through the Pinnacle Desert in Nambung National Park. After this action-packed day, return to Perth via the scenic Indian Ocean Drive for drop-off back at your hotel. Overall is good except for the overcooked lobster! Pinnacle and Lancelin were wonderful but Hillarys was not so much. Most of the shops were not open yet arrived too early? I didn't know how to spend the time there. I wish I could have spent that time in Pinnacle instead. The driver was friendly, the lunch fish and chips at the sea front was enjoyable. I had a great day on this tour led by Bob. Everything on the program from the hotel pick-up to the drop-off was perfectly coordinated, to the very last detail: the presentations, the stops and activities, the delicious seafood lunch and whatnot. I highly recommend this tour. Good service, friendly, not good, with lots of flies. Enjoy this Trip so much ... not to many places we visited but every single place is amazing ... try to slide in lancelin is so fun ... and eatng fish n chip in the dunes is delicious too .. and for Pinnacle Desert is one of my fave destination ... love it ..